Copyright Solar-Vision 2011, Brand New, Softcover, 48 Pages!! This book answers the age old question, "Can I communicate with the dead?". The author emphatically says YES, YOU CAN CONTACT THE DEAD! Osgood Stradt is back again, the well known author of TIME TRAVEL MAGIC "CRACKS OPEN" the topic of parallel universes OF HIS NEW BOOK, explains theories, subject matter, alternate timelines, as well as introduces experiments to test your reality as you know it and question it. TIME TRAVEL MAGIC: HOW TO SLOW DOWN, SPEED UP, REVERSE OR MANIPULATE TIME ITSELF by Osgood Stradt - 2010 softcover book, 44 pages! FIRST THINGS FIRST: WHAT IS TIME, REALLY? WHAT DO ALL PERIODS OF TIME IN ALL HISTORY HAVE IN COMMON? 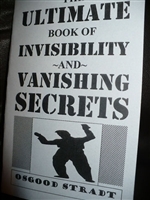 THE ULTIMATE BOOK OF INVISIBILITY AND VANISHING SECRETS By Osgood Stradt! Copyright Solar-Vision Publishing 2011, 44 pages, BRAND NEW, Softcover! 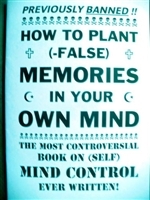 HOW TO PLANT FALSE MEMORIES IN YOUR OWN MIND by T. L. Crim (C) 2012 Solar-Vision Publishing, 44 pages. The book that ALMOST never got published. Certainly one of the most controversial books on the mind ever, this book takes the hidden, secret, and even denied "mind control" secrets one step further and puts the technology in the hands of the individual. YES - IT IS POSSIBLE TO PLANT "FALSE MEMORIES" IN YOUR OWN MIND! And these memories are "REAL" memories - indistinguishable from any other memories. If you are reading this, then you already KNOW the earth-shattering implications of this. WHY WOULD ONE WANT TO PLANT MANUFACTURED MEMORIES IN THEIR OWN MIND? MEMORIES ARE NOT DEPENDENT UPON EXPERIENCE! WHAT IS THE DIFFERENCE BETWEEN FANTASY AND MANUFACTURED MEMORY? SO… WHAT REALLY IS REAL? HOW IS REMOTE VIEWING DIFFERENT FROM ESP?